Starting a rhubarb-garden in your very own backyard, and growing-rhubarb for years to come will be very satisfying. 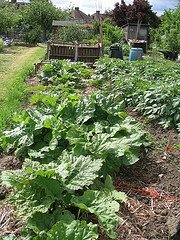 It is not too difficult to garden with rhubarb. If the conditions are right, planting-rhubarb can be a wonderful perennial which will return faithfully year after year. You only have to get it started on the right track with the proper soil, location and just a few other considerations. This wonderfully sour and tart plant is a cool season perennial. It is classed within the zone 2-9 and so it tolerates the cold winter weather very well. Dry conditions are not condusive at all though to a good harvest. The location of your garden is important. There should be a good mixture of sun as well as shade. The ground should be well weeded. The soil should be rich with manure or compost. Rhubarb thrives in well-composted dirt mixed with peat moss and organic materials. The garden should also have good drainage. My grandparents actually had their rhubarb-garden on a raised bed up against the back of their home. There was plenty of sun, and a cool shade later in the day. The plants grew extremely well and there was just no end to the picking. They also had one huge chunk growing out of an old tire! I always got the best rhubarb out of that one little spot. Air circulation is also an important factor. This prevents rotting on rainy days and after regular garden watering. You may want to consider also the landscaping that is around your rhubarb. So, as long as the soil is rich with the proper nutrients and the location seems just right, there is one thing left to consider. In addition to the compost, rhubarb requires nitrogen. Fertilizer should be applied in early spring as you begin to work your garden area. Of course it depends on just how big you would like your growing space to be, but usually a few cup-fulls will do. Adding some lime will also help to check the soil acidity also. Before you get started, do you have a gardening area where nothing seems to happen no matter what you do? There are common misconceptions out there when it comes to planting. You may also want to consider what other plants you should or should not have around your rhubarb. Sometimes, this does matter. Ideally to get the most out of your plants, fertilize 3 times during the year. In the early Spring, (March or April) is a good time before any growth begins. Fertilize again just after the growth appears, and at the end of the harvest season. The fertilizer should be worked well into the top of the soil and water it well also. Compost on top will provide food over the dormant period. There are so many different varieties and opinions of what strengths of fertilizer to use. Please check with your local nursery as to what they would suggest. Want To Share Some Good Gardening Tips? Ready to plant your Rhubarb-Garden? Need Solutions to any Landscaping Needs? Visit Here. Does your skin itch or feel light-headed after eating rhubarb? You could be extra sensitive and experiencing a rhubarb allergy . Be sure of what the symptoms are. Should I Go With Seed Or Not? If you want to start gardening rhubarb, you can always start it with seed. However, you are much further ahead to get a piece of rhubarb crown from someone else, otherwise, you may have a very long wait. This is just the nature of the rhubarb. The quality of seed you get will determine a large part of your successful gardening of vegetable garden plants in general. Be sure to check out the guides. Wine barrel rhubarb gardening is another tip I'd like to share. I've done it but in smaller containers. Check out the video as a family works on their 3 year-old barrel to divide and replant their rhubarb.